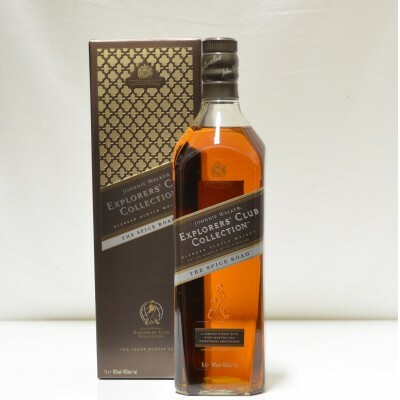 I slag off Johnnie Walker all the time, they’ve pretty much ruined the Red Label and the way they moved part of their operation out of Kilmarnock was shocking, Diageo were shameless in their attitude and if we were honest with ourselves we all know they’d move bottling out of Scotland all together if it saved them a few quid and they were allowed too. So now I’ve done myself out of anything favourable from them let’s have a look at what I’m reviewing today. Spice Road is a non age statement blended Scotch and is only available through Travel Retail outlets although it’s often at auction and a few online places seem to have it so really it’s available in loads of places but at Duty Free it’s thirty notes for a litre and I would be miffed if I had to pay more than that. So why on Earth did I buy this? Well I was in an airport, I was tired and a little bit wired because I’m not the best of flyers and really wasn’t looking forward to a nearly five hour flight and I find myself in the whisky shop of the duty with none of the bottles I’d looked at online available and starting to just randomly pick up bottles. I went for this because it was something new to me, it was pretty cheap at thirty quid a litre and I’d already selected another bottle as my main expensive purchase. So there I am, on my holiday and it’s late and the wee one is sleeping and my wife is chilling out in the bath and I’m out on the veranda of our suite enjoying the warm evening air and staring at this bottle, I crossed my fingers and I opened it and I have to say it’s absolutely perfect. Nose. A touch of smoke lingers all the way through this, regardless of water or not it’s always present and just superb, nice sherry cask and cinnamon, I also get a little chocolate and some roasted hazelnut notes, cracking. Palate. Smoke and chocolate, more soft dried fruit and nuttiness. Some spice again and a touch of heat with a hint of pineapple sharpness. Finish, More smoke but a small amount of fresh fruit lingers rather than dried, oak and charcoal. So, aye, I really can’t knock this, it’s like they’ve really tired to make a brilliant whisky and stuck to it, it’s pretty young whisky and it’s not as complex as the Green Label which I would liken it too, it’s like a lighter easy going version of it. I enjoyed this neat, with water and ice and worked well at all times. Oh, there is a bit of a caveat with this though, I had a couple of fingers worth of this every night and like I said, it was perfect, back home though and it seems to suffer a bit, it’s just not as nice, it’s still decent but I’d score it a couple of points down in every aspect if I was the sort who did scores, which I don’t, obviously.